Come here, little manling. I won't hurt you. I just want to tell you a... secret. What are you? And what are you doing here. Come closer, so I can talk to you. Hmm. Welcome. I am very happy to see you. I have a present for you. You do not belong here. Drop your weapons and submit, or be destroyed. You're still here? What in Creation ARE those Scamps and Vermai doing? Can't ANYONE do ANYTHING around here? Ahgh. THAT figures. With the load of Scamps she's got, she'll take ANYTHING in her service… even humans. Nice try, but Zenaide likes her soldiers dumb and ugly, and you don't qualify. Oh. I see. Excellent. I have a special message for her. Lean over and I'll whisper in your ear. Oh. Yeah. That's extremely likely. I believe I'll be killing you now. Boy, are you confused. Or stupid. Or both. Please die now. Your pardon, Syndic. So this is the original form, then? No point maintaining the Mariel form any more, I suppose… though it was not an unpleasing form, was it, heh, heh? Indeed, Sumeer is the master of us all, and his every breath is as nectar to his servants. A thousand pardons for disturbing your reflections. No more tricks, Master Kaid. Cute, but tiresome. Kaid. We know who you are, so spare us the cunning conceits. You are bold to present yourself thus, Kaid. I presume you have something you'd like to say? No more tricks, Master Trenelle. Cute, but tiresome. Trenelle. We know who you are, so spare us the cunning conceits. You are bold to present yourself thus, Trenelle. I presume you have something you'd like to say? Splendid. I have the pleasure to inform you that you are to be captured, not destroyed, and in keeping with this objective, I guarantee you your life, on my sacred oath of honor to the Great Powers, if you drop your weapons and shed your armor, and give yourself into my custody. You are being difficult. You've only yourself to blame if we are forced to discorporate you permanently. I'm afraid we're not interested in anything you have to say, Kaid. But if you have not yet spoken with Dremora Tanchelm, do so, please. That is all I have to say. To me it is no matter if you are the Emperor of Illimitable Splendor. Your presence is requested in the library. That said, I have followed my orders, and may return to the sport of chastising you. Nice speech, kid. But let me give you a hint. If Clan Dremora has a fault, it is the fault of pride. Perhaps threats may daunt other daedric clans, but they only inspire Dremora to greater risks and dares. I'm afraid we're not interested in anything you have to say, Trenelle. But if you have not yet spoken with Dremora Tanchelm, do so, please. That is all I have to say. You wish to stop our battle? We Dremora are not appeased by submission. We have no need of mortal captives. That is intriguing. What does a mere mortal have to say to a Dremora? Well, we don't all get what we want, do we? Perhaps I know something. But nothing I'm willing to share with you. At present. Now. Is there something else on your mind? Hmmm. You are clever, for a mortal. And you have backbone. Perhaps we can make use of you. You must not be the one we seek. Such a one would never sully his pride by such base groveling. Hah hah! But of course! Let us both use one another, and see who gets the greater use of the other! To do that one would travel beyond the gates of this land, thru the Chimera of Desolation, thru the Havok Wellhead, and finally to Dagon's personal pleasure palace. Only Jaciel Morgen, the immortal Nocturnal Lieutenant, can send you through the great locks that separate this realm from the next. But she has somehow hidden herself within the Shade Perilous. The great Daedra Lord, Mehrunes Dagon, was persuaded that this realm would be an essential waystation toward the conquest of Battlespire, and sanctioned our passage. But he did not sanction the overthrow and occupation of this realm. Understand. Dagon's Oathkin and Proteges, Faydra Shardai and Xivilai Moath, crushed this realm where they should have simply obtained passage by negotiation, or with limited force. These spawn of Dagon became -- overzealous in carrying out Dagon's orders. The dark temptations of this Nocturnal land proved far too appealing to them, and they overthrew the Shade Perilous while their Oathfather was occupied with weightier matters. Yes. Faydra unleashed her Fire Daedra and Xivilai's unchained his Frost Daedra, granting them free rein to lay waste to this precious corner of the Nocturnal realm. They relished the chance to revenge themselves on their ancient enemies, the Nocturnals. Quite true, but they have gone too far, and must be chastened. Now that Battlespire is ours, we no longer need to hold this land. But many Daedra minions of Faydra and Xivilai decided that this land was now their domain, and remained here instead of continuing to the next step on the invasion route. They must be expunged and good order restored -- in order to redress the balance. The order to be restored is the order of the Nocturnals. As for the balance… well, that is more wisdom than you require. Invoke the names of their lords, and they will grow docile and circumspect. Exploit their divisions and they will fall like barley before the scythe. One who would free your friend must gain the secret of passage from Shade Perilous to the Chimera of Desolation through the fugitive, the Nocturnal Lieutenant, Jaciel Morgen. But I have said too much. No one must know of our discussion. I will deny all knowledge of our colloquy. Now be off. Count yourself luckiest among all mortals that we have deemed you useful to our purpose. For had our goals not come into alignment, the last wisps of steam would now be rising from your lacerated lungs. That is not for you to know. 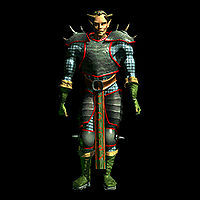 All you need know is that I and my fellow Dremora serve the Exalted and Most Puissant Lord, Gerent of Dagon, Mehrunes. If you have something worthwhile to say, say it quickly. This page was last modified on 31 August 2018, at 01:39.